Spiced Pear Upside Down Cake – a moist fall inspired upside down cake with half the sugar! 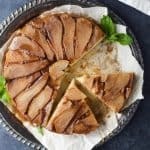 Spiced Pear Upside Down Cake – you’re gonna love this fall twist on a classic upside down cake with half the sugar. 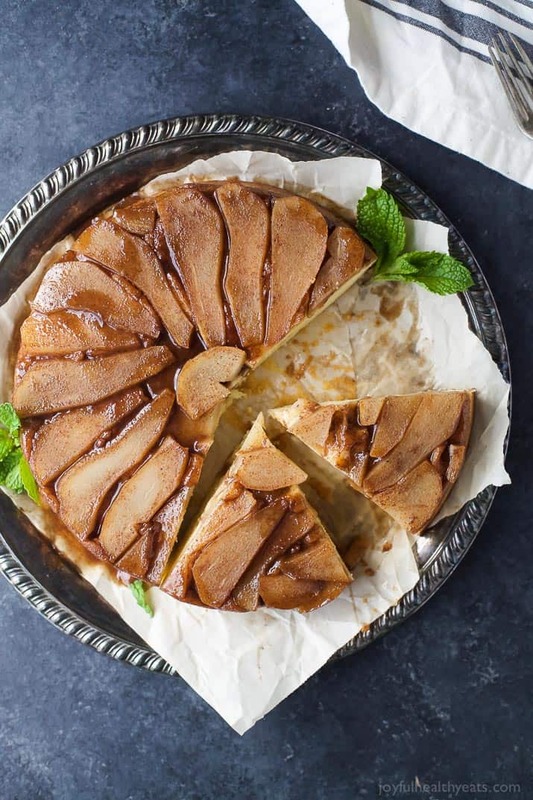 A spiced brown sugar topping filled with pears on top of a moist fluffy vanilla cake. De-lish! Guys this cake could be my proudest shining moment! Just look at how pretty it is! First off, I’ve never made upside down cake before… of any kind. But I was being adventurous and had a recipe idea. So trying to make an upside down cake for the first time, AND make it “waist friendly” was definitely a challenge. Never fear, I was up for it and ready to deliver a quality cake for you guys! Cuz you’re my peeps! So what’s my secret this holiday season to get in on that cake and cookie action, but still stay waist-friendly and not go into a sugar coma!? SPLENDA® Sugar Blends! 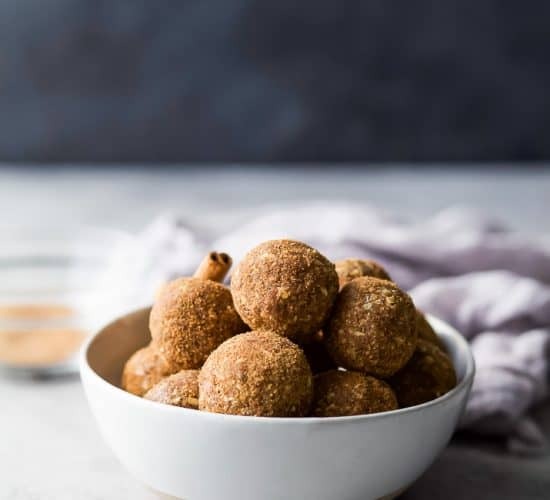 They have a Sugar & Stevia Blend and a Brown Sugar Blend, both of which you’ll need for the holidays! I have been using both of them for about a month now, experimenting with different recipes to make sure I liked the flavor and the quality before I shared it with you! Well, the verdict is in. 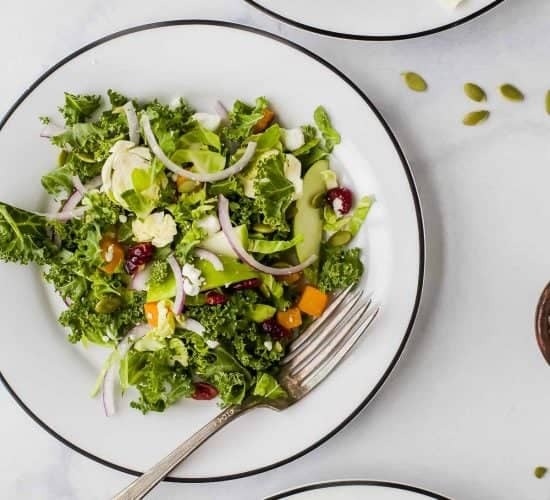 It’s awesome and an easy way to cut back on sugar this holiday season! These blend look and act like regular sugar, but it literally has half the sugar. Most importantly, and why it took me a month to experiment: there is NO BITTER AFTERTASTE (let the happy dance commence!) That part was huge for me – I definitely didn’t want to surrender taste for fewer calories. Up until now, every time I’ve tried using stevia, I didn’t really like the flavor. I learned that most stevia extracts use Reb A, which can have a bitter aftertaste. SPLENDA® Naturals Stevia Sweeteners primarily use Reb D, a cleaner tasting, less bitter extract from the leaf. So how is that sweetener made? Well stevia is actually the name of a plant! The stevia leaves from the plant are harvested, dried, and then steeped in water. Then the intense sweetening components of those leaves – including Reb D – are extracted, isolated, purified and dried. Simple as that. Here’s the crazy part: HALF a cup of the SPLENDA® Brown Sugar Blend replaces a FULL cup of regular brown sugar! Is your jaw dropping to the floor yet?! You can use this brown sugar blend anywhere you would normally use brown sugar and it acts the same way. 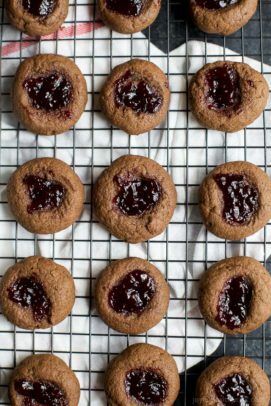 It gives you the same sweetness and browns those cookies to a T. It still has that same molasses flavor and leaves you with a moist baked product. I have made waffles with this blend, granola bars, cookies, pecan pie and now this cake. I’m telling you, it works! Just think of those Christmas Cookie Parties you have lined up this holiday season, sub the sugar with one or both of these products and you’ll have a secret that everyone will want to know about it! Namely, how did you cut the calories and sugar but still have one amazing cookie! Woohoo! Okay, so on to today’s recipe! 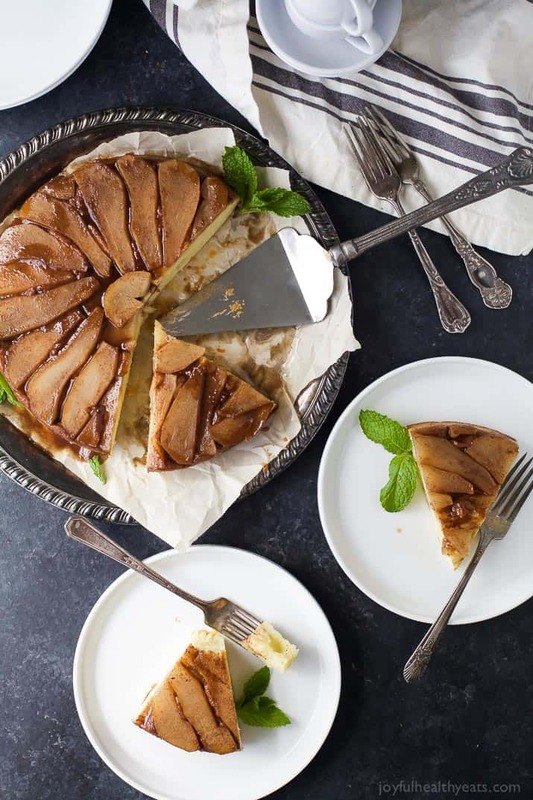 This Spiced Pear Upside Cake is going to blow your mind! It’s easier than it looks! But honestly, I do say a couple of prayers and give the cake pan a little rub of love when I’m getting ready to flip the cake upside down. And if we’re sharing all our cards, I actually made this cake twice in less than 3 hours because the first cake did not look “photo pretty.” Lets just say that Cason’s school crossing guards appreciated me that day because they each got half a cake! The key to making sure the pears don’t stick to the bottom is thoroughly spraying the cake pan. 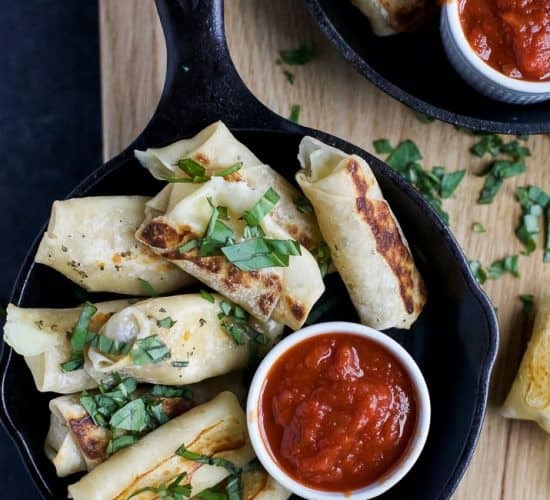 You don’t want an inch of that pan not covered or you’ll end up with a hot sticky mess. Once that’s done, line your pears along the bottom of the pan. I used fresh pears but if you’d like to use canned you totally can. Next up, the spiced brown sugar sauce. Normally people will put a sort of caramel sauce on top of an upside down cake. This caramel sauce recipe just has the Splenda Brown Sugar Blend, water, a tablespoon of butter and then all the spices of fall (cinnamon, clove & nutmeg!) 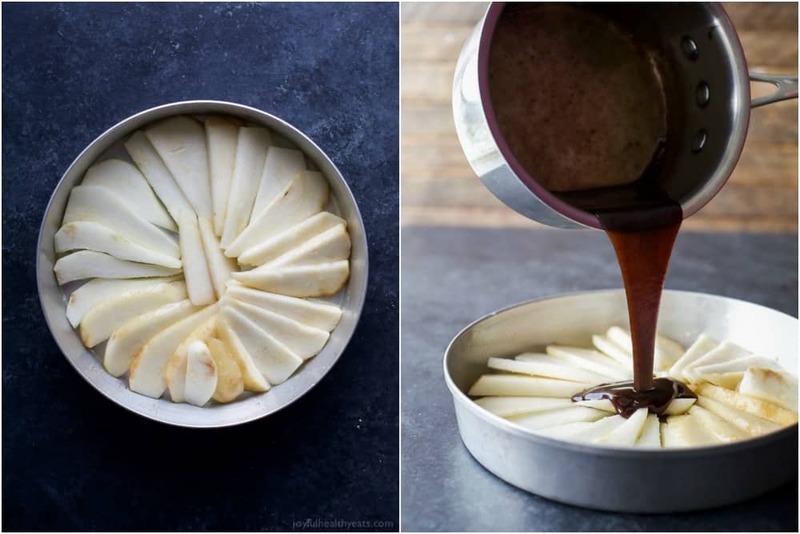 Once it starts to bubble up a little bit, remove it from the stove and pour the sauce over your pears! Then all you have left is the cake batter. It’s more of a vanilla based cake and I substituted the SPLENDA®Naturals Sugar & Stevia Sweetener Blend for regular sugar. This cake rises like a gem and is crazy moist! Just make sure you use a 9″ round cake pan. If you use an 8″ you’re gonna overflow, and no one wants to clean up an oven covered in cake batter. 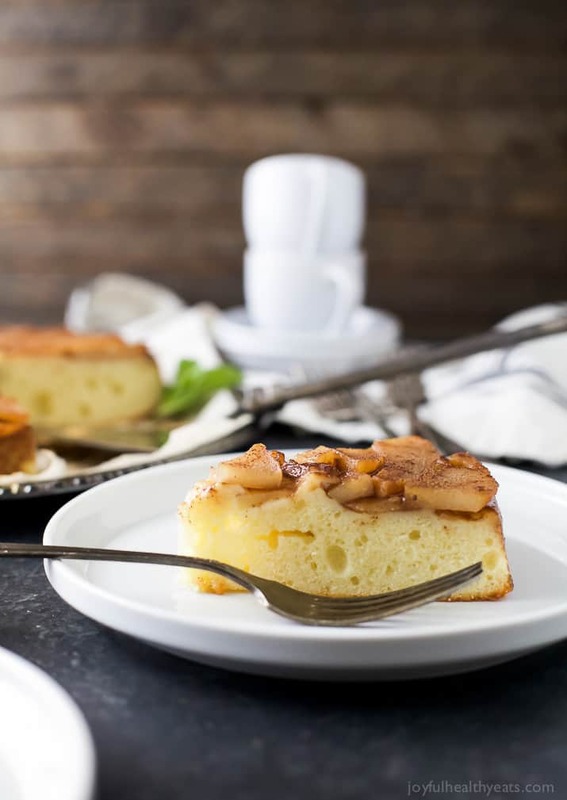 The subtle vanilla flavor from this fluffy moist cake combined with the intense spiced pear topping are going to blow your socks off. This cake is the perfect light dessert option for the holidays. Top it with ice cream or homemade whip cream, you could even add a little cinnamon in that whipped cream to really complement the flavors! 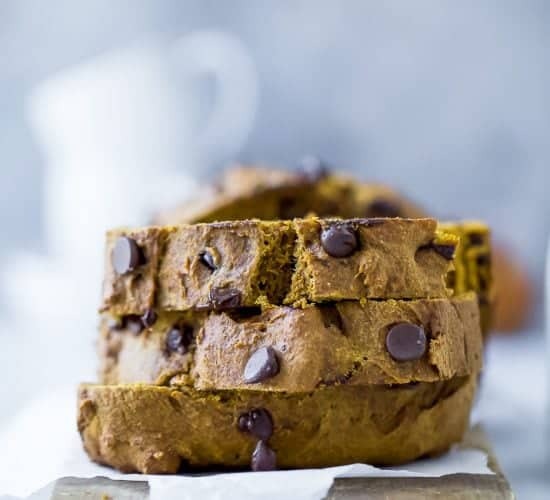 Serve it with a cup of coffee and wow… you’ll be the star of the night! I guarantee it! Now, if you want to get you some of those holiday waist-friendly SPLENDA® Sugar Blends they are sold at most grocery stores in the sugar/sweetener aisle (I usually see them by the agave.) Or you could order them online and have them shipped right to your house. Either way, make sure they are in your pantry before holiday baking season commences! 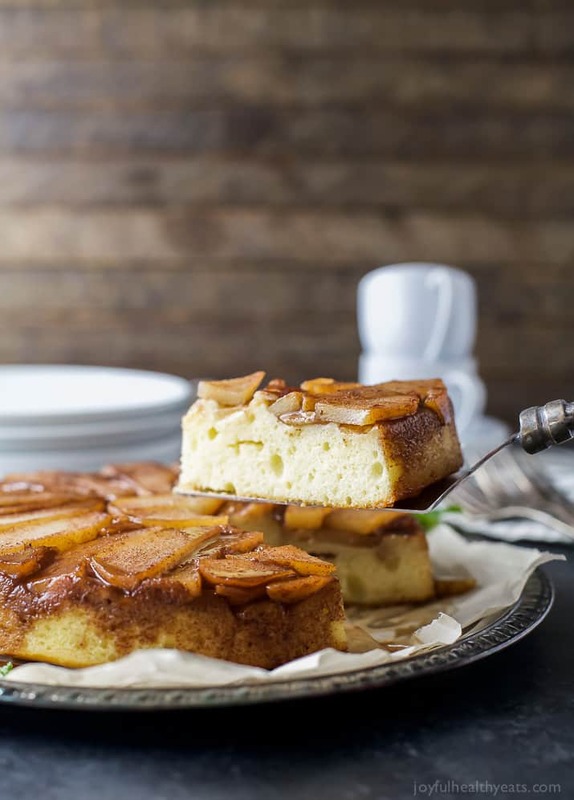 Spiced Pear Upside Down Cake – you’re gonna love this fall twist on a classic upside down cake with half the sugar. 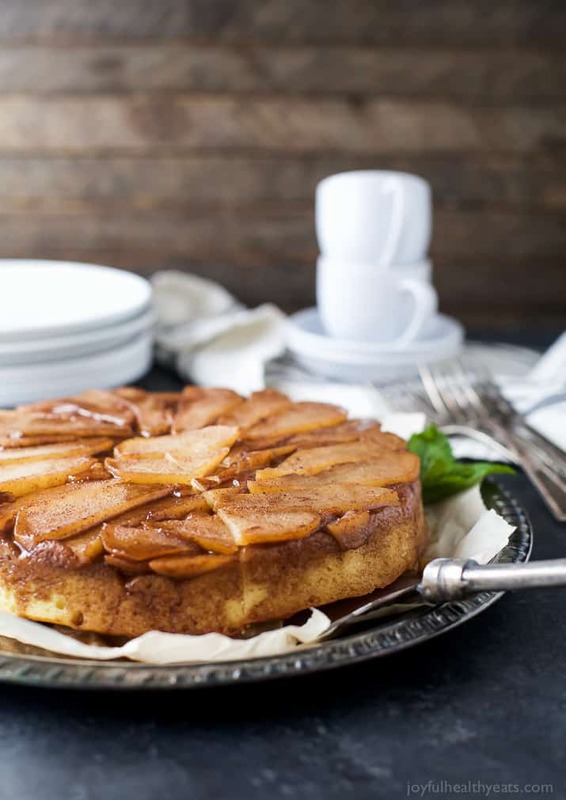 A spiced brown sugar topping filled with pears on top of a moist fluffy vanilla cake. Prepare a 9″ round cake pan by spraying with cooking spray on bottom on sides (you could also use butter). 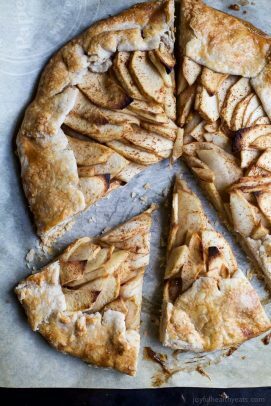 Arrange pear slices on the bottom of the pan. To a small sauce pan over medium heat, add SPLENDA® Brown Sugar Blend, water, butter, cinnamon, nutmeg, clove and a pinch of salt. Cook on medium heat, whisking the entire time until the sauce begins to thicken and sugar is dissolved. About 4-5 minutes. Pour the sauce of the pears. Being careful not to mess up the arrangement. For the Cake: add flour, baking powder and salt to a small bowl. Set aside. To a large bowl, add SPLENDA® Sugar & Stevia Sweetener Blend, eggs, yogurt and vanilla. 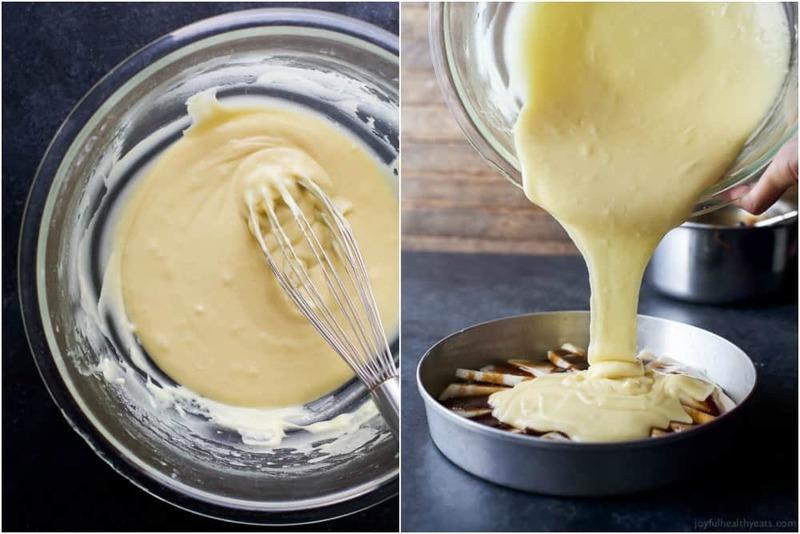 Using a whisk, stir together until the mixture is smooth and lumps are removed. Slowly add the flour mixture into the wet mixture, whisking the whole time. Lastly add the oil to the bowl and whisk until combined. Pour the cake batter over the pear and sugar sauce, again being careful not to disturb the arrangement. Remove cake from oven and place pan on a wire cooling rack for 5-10 minutes. 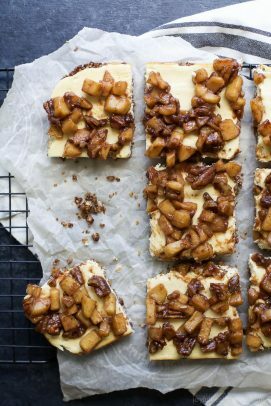 Place serving platter on top of the cake pan, say a little prayer and then flip the cake so the caramelized pears are on top. Want More Holiday Dessert Recipes? Example: Thank you to SPLENDA® Brand for sponsoring this post. As always, all opinions are my own. I have been wanting to make a dessert with pears! Thanks for this! Oh my gosh – this looks AMAZING! Beautiful! I always forget about pears! 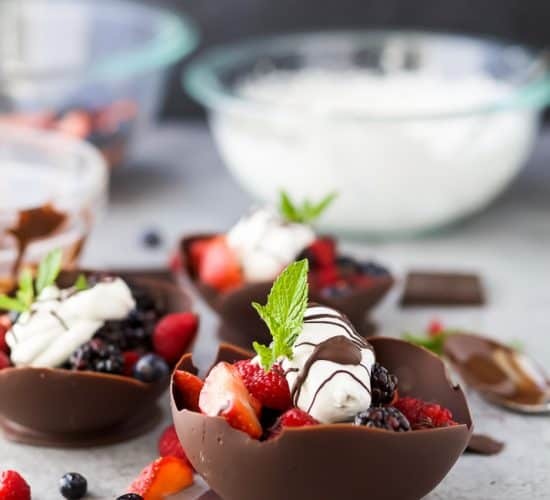 I love them so I know I will love this dessert! I love baking with seasonal fruits! What a great use of pear! Pears don’t get enough love during the fall season. This dessert is gorgeous! 🙂 And I love that it has less sugar as well.